Victor Stone’s body recalibrates with the cybernetic parts that have now been grafted onto him. He interfaces with the computer systems around him and defeats the attacking monsters before fleeing from his father upon learning he was the one who did this to him. Elsewhere Aquaman and the rest of the heroes bicker about who should lead. Cyborg continues to cut a path through Darkseid’s forces and apparently assimilates a “mother box” which reveals that the forces of apokalips plan to destroy earth through the absorption of all organic life. He teleports to the others as Darseid attacks! Covers- All four covers are gorgeous so much infact I parted with much $$ to get each. 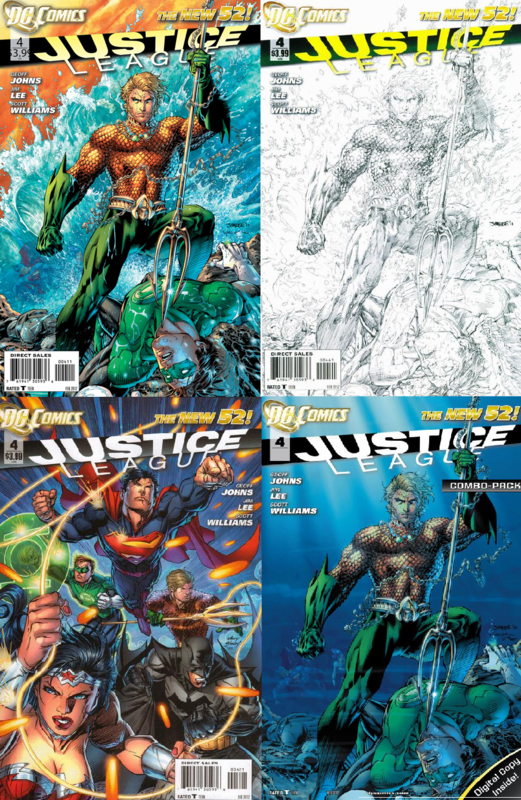 Jim Lee you wound me with these works of art! 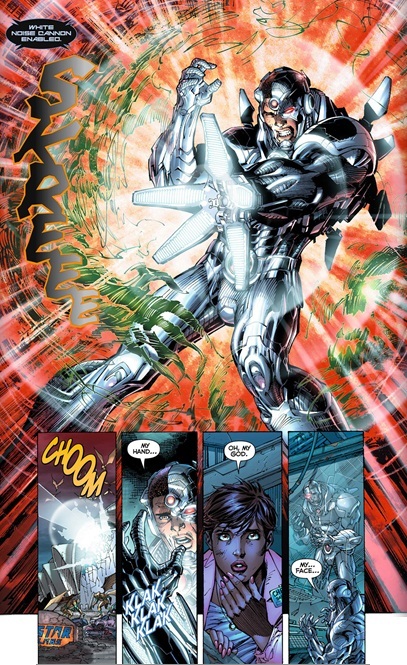 Cyborg- Every other member of this team has a solo book so it’s understandable that Victor is our eyes and ears in this new start to the justice league. Also good is the humanity invested into Victor. Outwardly he is arguably the most inhumane of the lot but he’s the most thoroughly developed individual of this team in these pages (on a side note I’m not reading any of the other characters solo books). The new Justice League- Finally all the players are in place, the stakes are known the enemy is revealed, action is bound for next issue! It was also amusing to see the different personalities play off each other even if Green Lantern was annoying as hell! Aquaman– Not since Grant Morisson had one handed long bearded Aquaman, has he been portrayed as nearly this cool! It was so cool I may even consider picking up his solo book next month. 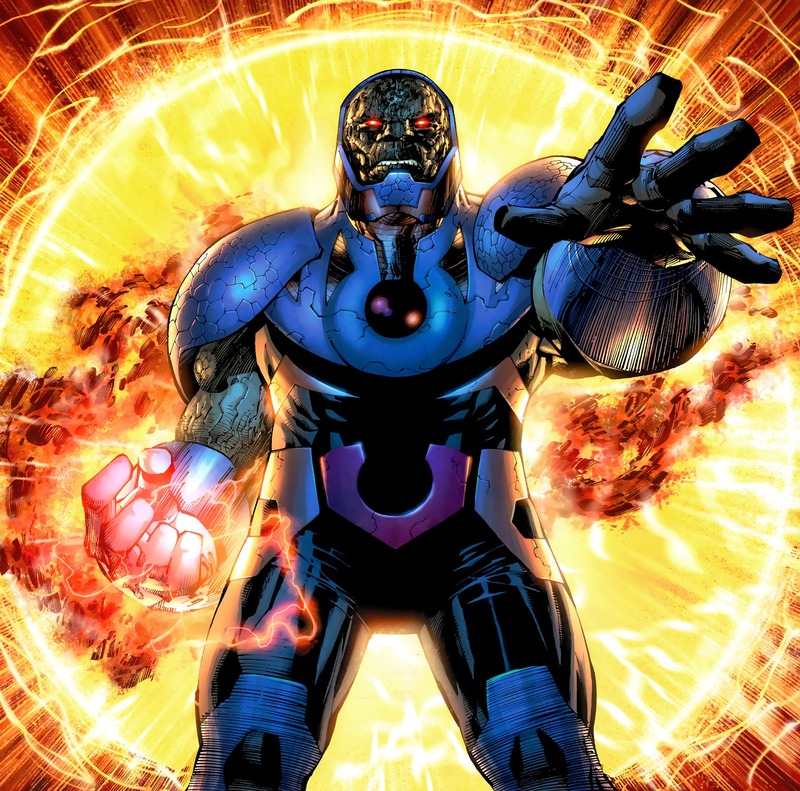 Darkseid- Ever since Grant Morisson’s JLA and the superman animated series I’ve been a huge Darkseid fan and his moderate redesign looks great! He is the perfect Villain for earths gathered heroes, can’t wait to see him in action next issue! Humor– The assembled heroes were hilarious to watch bicker like children about who should lead. Nice touch since things could have easily been so sombre and dull. 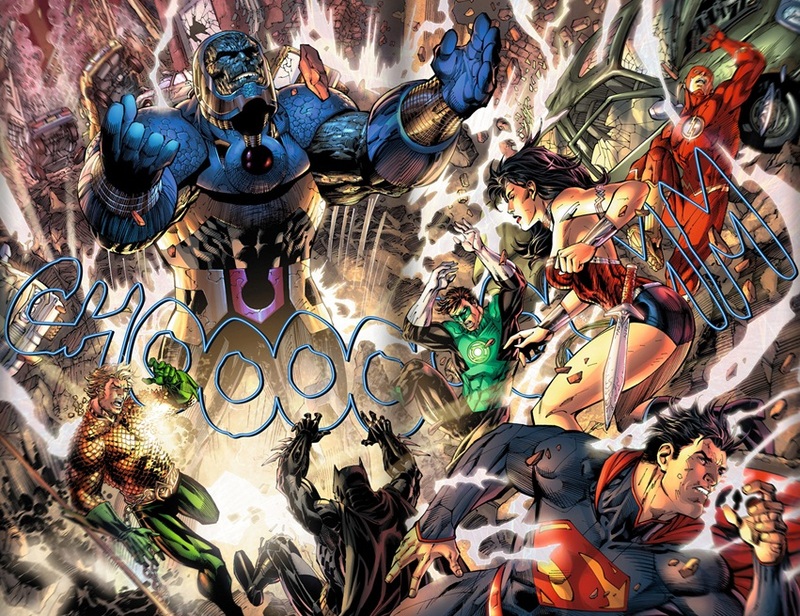 Art- Jim Lee is the only artist I really liked back in the 90’s who still turns out some good art. Pacheco has been dull on Uncanny X-men and don’t get me started on Bachalo on Wolverine and the x-men (yuck) Kudos to lee on maintaining his high standard!